Over the weekend of 22nd – 24th June, the Nautical Archaeology Society (NAS) will be running a maritime field school at the Red Wharf Bay Sailing & Water Sports Club on Traeth Bychan Beach, Anglesey. The event forms part of a Heritage Lottery Funded project instigated by the Royal Commission on the Ancient and Historical Monuments of Wales (RCAHMW) to commemorate the centenary of the end of the First World War. Over the course of the weekend (weather permitting), divers will be launching their boats to dive the wreck of the Cartagena, a steam trawler that was built during World War One to trawl for mines around the Welsh coast, but now lies in 37m of water, around 6-miles off Traeth Bychan. 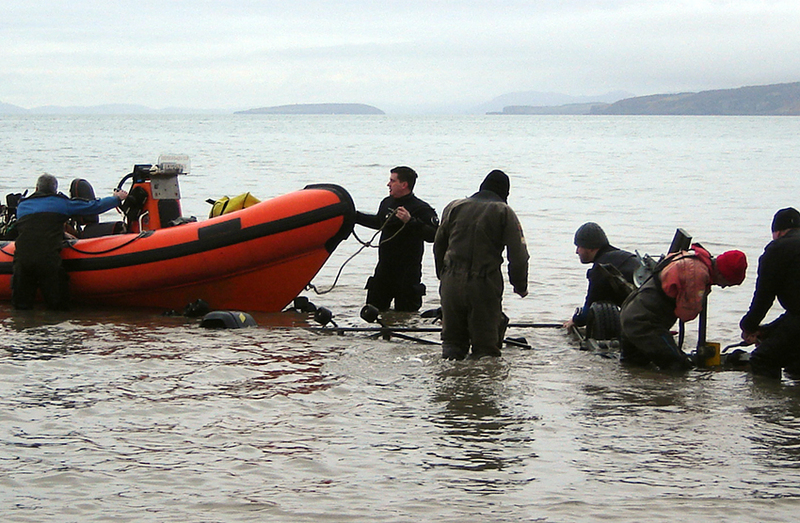 Divers launching their boat prior to diving the wreck of the Cartagena – © Malvern Archaeological Diving Unit. As part of the project, Bangor University, School of Ocean Sciences have been recording World War One wreck sites around the Welsh coast from their survey vessel the Prince Madog, including the wreck of the Cartagena, and their results will be on display during the field school. The ‘U-Boat Project’ commemorates the Great War at Sea around the coast of Wales. It is a 2-year Heritage Lottery Funded partnership project led by the RCAHMW, with an overall value of £1M, which provides unprecedented access, for the first time in 100 years, to the remains of 17 wrecks on the seabed off the Welsh coast which are part of our Great War heritage, but which remain under-researched and under-valued. A programme of marine geophysical survey undertaken by the Centre for Applied Marine Sciences, School of Ocean Sciences, Bangor University, during the spring and summer of 2018 will capture high resolution multi-beam data for the Project’s chosen 17 wrecks. Additional survey work, involving the Nautical Archaeology Society, will include the capture of underwater video footage on 5 of those wrecks, which will be combined into 3D inter-active digital models for use in the Project www site and a travelling exhibition. The Project’s travelling exhibition will visit eighteen Welsh maritime museums from July 2018, before closing in December 2019. Each of the museums hosting the travelling exhibition are delivering a programme of community engagement activities, where volunteers of all ages and backgrounds will engage with this heritage to explore, reveal and tell the stories of the people who served on the 17 vessels and those affected by loss and the impact of the war just off the Welsh coast. The Project is a partnership between three organisations, the Royal Commission on the Ancient and Historical Monuments of Wales (Royal Commission), Bangor University and the Nautical Archaeology Society. The Royal Commission is the lead partner, at the centre of the network of museums and archives around the coast of Wales hosting the travelling exhibition, plus youth, service personnel, and social care charities.